Murat O. Balaban is an internationally recognized leader in the area of food engineering. His research focuses on applying sensor technology to the processing of Florida’s food and agricultural materials in order to increase their quality. Balaban’s work entails a three-part strategy for improving food processing: research, automation of food evaluation methods and development. 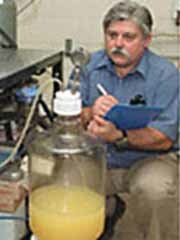 His research endeavors include developing a process to cold-pasteurize juices such as orange juice that would preserve flavor while ensuring safety. The university has been granted a patent for this research, which could help increase the value of Florida’s non-pasteurized juice industry. Balaban’s second objective involves automating the evaluation of food and agricultural materials. His lab is working to develop computerized methods to objectively evaluate these materials. One example is computer software that can quantify color changes in foods. Balaban also works with the new technology of the electronic nose to objectively measure the odor of various foods. These simplified objective techniques may one day assist and expand the techniques currently used by federal inspectors. Balaban develops theories, models and tools in the form of computer software to better describe, control and optimize food and agricultural processing operations. These include models for heat transfer and refrigeration, for example, and software to facilitate the understanding and simulation of these processes. Balaban’s record of achievement in the past five years is nothing short of remarkable. Twenty-three journal articles, 13 book chapters, numerous honors and awards, international talks, copyrighted software and a patent reflect his dedication to both his discipline and to Florida agriculture.